Sign in using your email and password. Forgot your Password? Trip type (person or vehicle trips). The app is only available as part of the ITE Trip Generation Manual, 10th Edition Bundles. With the purchase of a standard or electronic bundle from the ITE Marketplace, users receive a web app unlock key. Use this unlock key when creating an account to access ITETripGen Web-based App. © Copyright 2017 | Developed in Collaboration with Transoft Solutions Inc.
To register, please fill out all the fields below. You will receive a confirmation email with your account information and password. to ITETripGen Web-based App. (Opt-Out anytime. Please enter the email address associated with your account. We will send you a code which you need to enter to change your password. Kindly check your email after clicking on CONTINUE for the code to change your password. Please enter the code sent to your Email. Please enter your new password and confirm the same. Thank you for your interest in ITETripGen Web-based App, developed by the Institute of Transportation Engineers in collaboration with Transoft Solutions. An activation link has been sent to the email you used to register. Please activate your account by clicking on the link provided in the email. Check your spam folder if this email does not show up in your inbox. If you have any questions, please contact Sales Support at http://www.transoftsolutions.com/inquire. Access to the application is provided only after you activate your account by clicking on the link in the email. Transoft Solutions Inc. (“Transoft”), is committed to providing the Subscribers with quality Software and related documentation and services. From time to time, Transoft collects, uses, and discloses Personal Information. Protecting Personal Information is one of Transoft’s highest priorities. Transoft will inform Subscribers of why and how it collects, uses and discloses their Personal Information, obtain their consent where required, and only handle their Personal Information in a manner that a reasonable person would consider appropriate in the circumstances. 1.5 “Subscriber” means a customer of Transoft who uses the Software. 2.1 Collection of Personal Information. Unless the purposes for collecting Personal Information are obvious and the Subscriber provides his or her Personal Information for those purposes, Transoft will communicate to the Subscriber the purposes for which Personal Information is being collected, either orally or in writing, before or at the time of collection. Transoft will only collect Subscriber information that is necessary to fulfill the following purposes: to collect payment for the Software and related services; to verify identity; to deliver the Software, upgrades, and related documentation; to provide services; and to contact the Subscribers about products and services that may be of interest. 2.2 Data. Transoft will take steps to protect Personal Information contained in the Data. Without limiting the generality of the foregoing, Transoft will take the steps set out in Section 5.3. 3.1 Consent. Transoft will obtain consent from the Subscribers to collect, use or disclose Personal Information. Consent can be provided orally, in writing, or can be implied where the purpose for collecting using or disclosing the Personal Information would be considered obvious and the Subscriber voluntarily provides Personal Information for that purpose. (f) to investigate an anticipated breach of an agreement or a contravention of law. 4.1 Use and Disclosure. Transoft will only use or disclose Personal Information where necessary to fulfill the purposes identified at the time of collection. 4.2 Delivery to Third Parties. Except with consent from the Subscriber, Transoft will not deliver Personal Information to third parties for any reason. 5.1 Retention. If Transoft uses Personal Information, it will retain that Personal Information for at least one year after such use so that the Subscriber has a reasonable opportunity to request access to it. Subject to the foregoing, Transoft will retain Personal Information only as long as necessary to fulfill the identified purposes or a legal or business purpose. 5.2 Accuracy. Transoft will make reasonable efforts to ensure that Personal Information is accurate and complete. The Subscriber may request a correction to their Personal Information in order to ensure its accuracy and completeness. A request to correct Personal Information must be made in writing and provide sufficient detail to identify the Personal Information and the correction being sought. (d) storing Personal Information on secure servers. (c) the disclosure would reveal Personal Information about another individual. (b) provide written notice of an extension where additional time is required to fulfill the request. IMPORTANT! PLEASE CAREFULLY READ THE FOLLOWING AGREEMENT! This is a legal agreement between you, as End User, on the one part (hereinafter referred to as “End User”, “You” or “Your”), and the INSTITUTE OF TRANSPORTATION ENGINEERS, a Connecticut non-profit corporation with its office at 1627 Eye Street, NW, Suite 600, Washington, DC 20006, United States hereinafter referred to as “ITE”) on the other part. This Agreement concerns and governs Your use of certain Licensed Products made available by ITE. IF YOU COPY OR USE ALL OR ANY PORTION OF THE LICENSED PRODUCTS WITHOUT ACCEPTING AND ENTERING INTO THIS AGREEMENT OR OTHERWISE OBTAINING WRITTEN PERMISSION OF ITE, YOU ARE VIOLATING COPYRIGHT AND OTHER INTELLECTUAL PROPERTY LAWS AND YOU MAY BE LIABLE TO ITE AND ITS LICENSORS FOR DAMAGES. YOU MAY ALSO BE SUBJECT TO PROSECUTION UNDER APPLICABLE LAWS. ACCEPTANCE OF AGREEMENT BEFORE USE. BEFORE YOU USE OR SIGN UP FOR THE USE OF ANY PORTION OF THE LICENSED PRODUCTS, YOU MUST ACCEPT THE TERMS AND CONDITIONS OF THIS AGREEMENT BY CLICKING “I AGREE” By communicating to ITE Your acceptance of this Agreement when You use or sign up for the use of the Licensed Products, you are entering into a legal and binding contract with ITE and agree to be bound by the terms and conditions of this Agreement. If you are entering into this Agreement on behalf of a company or other legal entity, your acceptance represents that you have the authority to bind such entity to these terms, in which case the words “End User”, “You”, or “Your” shall refer to such company or other legal entity. If you do not agree with this Agreement, or if you do not have the authority to bind your entity, then you, the “End User” and “You”, will not be authorized to use the Licensed Products. is already in possession of the Recipient or any of its parent, subsidiary or affiliated companies and was obtained without an obligation of confidence. is or becomes publicly available without breach of this Agreement. is disclosed in response to a valid order of a court or other governmental body of Canada or the United States of America or any political subdivisions thereof legally authorized to order the disclosure of certain information (“Authorized Entity”); provided, however, that the Recipient will first have given notice to the Disclosing Party, unless this is forbidden by the Authorized Entity, and made a reasonable effort to obtain a protective order requiring that the information or documents so disclosed be used only for the purposes for which the order was issued limit the disclosure and use of Confidential Information to the minimum required by the Authorized Entity. 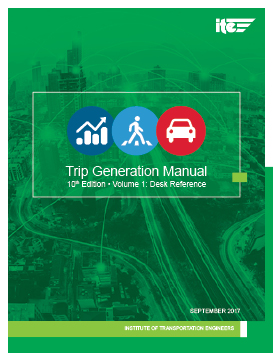 1.4 “Desk Reference” means the Trip Generation 10th Edition Desk Reference whether in electronic or hardcopy, published by ITE. The Desk Reference provides detailed descriptions of the new urban and person-based data, key instructional information, sample plots and identifies significant changes from the previous edition. 1.6 “Documentation” means any documentation (whether in electronic or printed or printed form) developed by Transoft and provided to or made available to the End User by ITE or through Transoft for the purposes of identifying the terms and conditions of access, use or operation of the Software, explaining or describing the Software, providing instructions as to the manner of permitted access or use of the Software, assisting the End User with problems or corrections to the Software or otherwise intended to assist the End User in the effective and permitted access, use and operation of the Software, and includes but is not limited to user guides, manuals, Help Menus and text, FAQ (frequently asked questions) files, license files, license specifications and details but documentation does not include the ITE Products which are provided by ITE to the End User by way of separate agreement or purchase..
1.12 “License Fee” means the fee plus all applicable taxes payable by the End User to ITE as a condition of the End User’s use of the Licensed Products during the License Term. 1.16 “TGH” means the Trip Generation Handbook, whether electronic or hardcopy, published by ITE from time to time which is currently in its 3rd Edition providing guidance on proper techniques for estimating person and vehicular trip generation rates; guidance for the evaluation of mixed use developments and the establishment of local trip generation rates; and pass-by trip and truck trip generation data. 1.18 “TGM plots” refers to the full set of data plots for all land uses distributed, published by ITE in electronic format. Subsets of the TGM plots, referred to as “Land Use Packages” are also published by ITE in electronic format. 1.19 “Transoft” means Transoft Solutions Inc. 350-13700 International Place Richmond, BC, Canada V6V 2X8, the owner and developer of the Software and the Documentation. 1.20 “Value Added Taxes” means such sum as will be levied upon the License Fee or any other fees payable pursuant to this Agreement by the Federal or any Provincial or Territorial Government and is computed as a percentage of the fees and includes Goods and Services Tax, Harmonized Sales Tax and any similar tax, the payment or collection of which, by the legislation imposing such tax, is an obligation of ITE. 2.1 Software and Services. Pursuant to ITE’s license agreement with Transoft, ITE grants by way of a limited sub-license to the End User, subject to the terms and conditions of this Agreement the non-exclusive, non-transferable and non-assignable right to use the Licensed Products during the Term for the purpose of its business. ITE, through its subcontractor Transoft will host the Software, including providing data support, backup, and recovery and access to the Documentation. ITE will provide to you the ITE Products by way of separate agreement and purchase arrangements directly with ITE. 2.2 Additional Terms and Restrictions. ITE reserves the right to at any time change any of the terms of this Agreement. Without limiting the generality of the foregoing, ITE may include additional terms with respect to connection time, may limit the number of projects or look ups by the End User, and may set a minimum hardware and browser requirement. use the Software to develop any derivative works of functionally compatible or competitive computer programs to the Software or create derivative works based on the Software. 2.5 Restrictions. Notwithstanding the generality of this Agreement, the End User will not, and will not permit others to, transmit, convey, license, sub-license, distribute, sell, resell, transfer or otherwise dispose of the Licensed Products or the ITE Products to any other persons or organizations. The End User further agrees that the Software will not be accessed or used in any manner prohibited by the United States Export Administration Act or any other United States laws or any applicable national or international export laws, restrictions or regulations (collectively, the “Export Laws”). In addition, if the Software is identified as an export controlled item under the Export Laws, the End User represents and warrants that it is not a citizen of, or located within, an embargoed or otherwise restricted nation and that the End User is not otherwise prohibited under the Export Laws from receiving the Software. All rights to use the Software are granted on the condition that such rights are forfeited if You fail to comply with the terms of this Agreement. 2.6 Survival. The provisions of this Article 2.0 will survive termination of this Agreement. keep secure Login Details for the Intended User, and will ensure that no person other than the Intended User has access to the Login Details. Unless ITE has explicitly agreed and determined otherwise in writing, a license or sub-license is required and must be paid by End User for each Intended User. If You are uncertain about the applicable scope of the license, the number of permitted Intended Users or have other inquiries, kindly contact ITE or see the licensing tab in the program settings of the Software. 3.1 Term. The term of this Agreement will commence on the Commencement Date, and will remain in effect until the release of TGM Edition 11 or August 31, 2021 whichever comes first. Termination under paragraph 3.2(b) (i) and 3.2(b) (ii) above will in the absence of a cure become effective automatically upon expiration of the cure period set out in the applicable paragraph. the End User will immediately pay to ITE any amounts owing to ITE by the End User pursuant to the terms of this Agreement. 3.4 Deletion of Data and User ID. Within 30 days of expiry or termination of this Agreement for any reason ITE will have the right to delete the End User’s ID profile and all of the End User’s data (if any) stored on any storage systems of ITE or its subcontractor Transoft. 4.1 Additional Services. Services outside of the scope of the description in this Agreement (the “Additional Services”) will not be included in the License Fee. Upon request for Additional Services by the End User, ITE will (or will request that its subcontractor Transoft) provide a quote for the cost for such Additional Services based on the hourly rates chargeable by ITE or Transoft, as the case may be, at the time of the request. ITE will perform the Additional Services on the written request of the End User, and the End User will pay for the Additional Services plus Value Added Taxes, if applicable within 30 days of receipt of an invoice for such Additional Services. 4.2 Interest. Any amounts not paid when due to ITE or Transoft, as the case may be, pursuant to the terms of this Agreement will bear interest at a rate of 24% per annum. software not developed by ITE in conjunction with its subcontractor Transoft. 5.2 Acknowledgement. The End User acknowledges and agrees that except for the limited warranty pursuant to paragraph 5.1, the Software is provided “as is” and each of ITE and Transoft makes no warranty, representation or guarantee, expressed implied or statutory, with respect to the Software whether as to the accuracy, reliability, suitability, function, absence of errors, or otherwise whatsoever and each of ITE and Transoft specifically disclaims any warranty of merchantability or fitness for a particular purpose. 5.3 Disclaimer. In no event will ITE or its affiliated companies, directors, employees, or contractors, including without limitation, or Transoft or its affiliated companies, directors, employees, or contractors (collectively the "Representatives") be liable for any damages arising from the End User’s use or inability to use the Software or for any loss or damage whether caused or alleged to be caused directly or indirectly by the Software including, but not limited to, any interruption of service, loss of business or anticipated profits, loss of goodwill, loss of data, computer failure, lost savings, or incidental, special, punitive or consequential damages resulting from the use or operation of the Software even if caused by the negligence of ITE, Transoft or any of the Representatives and even if ITE, Transoft or any of the Representatives had the knowledge of the possibility of such liability, loss, or damage. Notwithstanding the generality of the foregoing, any liability of ITE, Transoft and any of the Representatives is limited exclusively to the provisions of paragraph 5.1. 5.4 Limitation. Without limiting the generality of Sections 5.2 and 5.3, under no circumstances will ITE, Transoft or any of the Representatives become responsible for any costs, payments, claims or damages, other than to refund to the End User. 5.5 Access. Without limiting the generality of Section 5.3, the End User acknowledges and agrees that the Software may be unavailable from time to time as a result of scheduled and unscheduled maintenance or other circumstances beyond the control of ITE and Transoft. 5.6 Data. Without limiting the generality of Section 5.3, the End User acknowledges and agrees that the results produced by the Software is compiled from the ITE Data. Each of ITE and Transoft makes no representation as to the accuracy or reliability of the data or information produced by the Software. If at any time there is a discrepancy between the data produced by the Software and the ITE Data, the ITE Data will prevail. except with the written consent of the other party not use or disclose the Disclosing Party’s Confidential Information for any purpose. Without limiting the generality of the foregoing, neither party will not use or attempt to use the Disclosing Party’s Confidential Information in any manner which may injure or cause loss either directly or indirectly to the Disclosing Party or its End Users or suppliers. 6.2 Survival. The provisions of this Article 6.0 will survive termination of this Agreement. 7.1 Notice. Any notice required or permitted to be given under this Agreement will be in writing, and be delivered to the address first above written or such other address as the parties may, from time to time, designate. Notice will be delivered by personal delivery, courier, registered mail, via facsimile transmission or via confirmed electronic mail. The delivery of a notice will be deemed effective upon receipt, if delivered personally or by courier, or five (5) business days from sending, if delivered by registered mail or the date of transmission, if delivered by facsimile or upon acknowledged receipt by the recipient if delivered by electronic mail. 7.2 Entire Agreement. This Agreement contains the entire agreement between the parties respecting the subject matter, and supersedes all other agreements whether written, or oral between the parties, it being expressly understood that there are no other representations, terms, warranties, conditions, guarantees, promises, agreements, collateral contracts or collateral agreements express or implied, or statutory, other than those contained in this Agreement and that this Agreement represents the whole of the Agreement between the parties, and no alteration, modification or amendment hereof will be binding unless made in writing and signed by the parties hereto. 7.3 Additional Acts. The parties will do such additional acts and execute and deliver such further documents as may be requisite to give full effect to the terms of this Agreement. 7.4 Severability. The invalidity of any particular portion, section or paragraph of this Agreement will not affect the validity of any other provision herein and, in such event, such invalid provision will be severable from this Agreement and the remainder of this Agreement will be construed as if such invalid provision was omitted. 7.5 No Waiver. No waiver by any party hereto of any breach of any covenant, representation, warranty, proviso, condition or stipulation herein contained whether express or implied or negative or positive in form by any other party hereto will have any effect or be binding upon any party hereto unless same will be in writing and under the authority of such party, and any waiver whatsoever will extend only to the particular breach so waived, and will not limit or affect the right of any party with respect to any other or further breach. 7.6 Governing Law. This Agreement shall be construed, governed, interpreted, and applied in accordance with the laws of the State of Delaware, without giving effect to the principles of conflict of laws. In the event that any action is filed in relation to this Agreement, the party which does not prevail in such action shall pay the reasonable attorneys’ fees and other costs and expenses, including investigation costs, incurred by the prevailing party in such proceedings. 7.7 Counterparts. This Agreement may be executed in any number of counterparts, each of which will be deemed to be an original, but all of which together will constitute one and the same document. 7.8 Gender. Whenever the singular or the masculine is used herein, same will be deemed to include reference to the plural, feminine and body corporate as necessary. 7.9 Binding Effect. This Agreement will enure to the benefit of and be binding upon the parties hereto and their respective heirs, executors, administrators, successors and permitted assigns. Thank you for using ITETripGen Web-based App, the premier online software of Institute of Transportation Engineers (ITE), to aid engineers and planners assess traffic study data. ITETripGen is experiencing higher than normal usage at the moment and cannot handle your request at this time. Please try again later, or notify us at tripgen@ite.org . Your subscription to ITETripGen has been expired. Please contact Sdollins@ite.org to renew. Your subscription to OTISS Pro is expiring shortly. Please contact sales@transoftsolutions.com to renew. You have successfully activated your ITETripGen Web-based App. Please login to begin using the application. Please try again later, or notify us at tripgen@ite.org.